All spiders are capable of spinning silk, regardless of whether they use it to spin webs and trap prey or not. Egg sacs, drag lines (so they can find their way home), drop lines (to catch them if they fall) egg cases and transportation (young spiders disperse by “ballooning” as the wind catches their silk and carries them off) are some of the other functions silk plays in the life of a spider. Silk is extruded through nozzles called spinnerets located near the tip of the abdomen. Typically a spider has two or three pairs of spinnerets. Each one is the exterior tip of an interior silk gland and has a valve which can control the thickness and the speed with which the silk is extruded. The different glands produce different kinds of silk used for different purposes. The spinnerets work independently for some functions, and together for others. 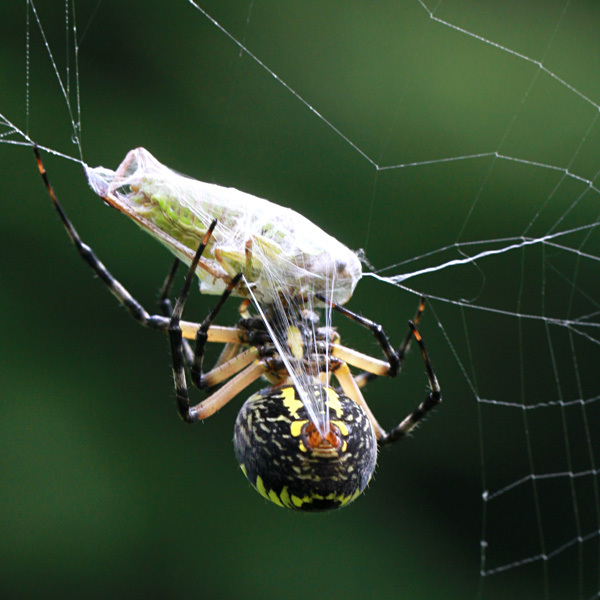 In the photograph, the black and yellow argiope is turning her grasshopper prey around and around as she produces a sheet of silk in which she wraps it. Most, if not all, of the spinnerets are in use.